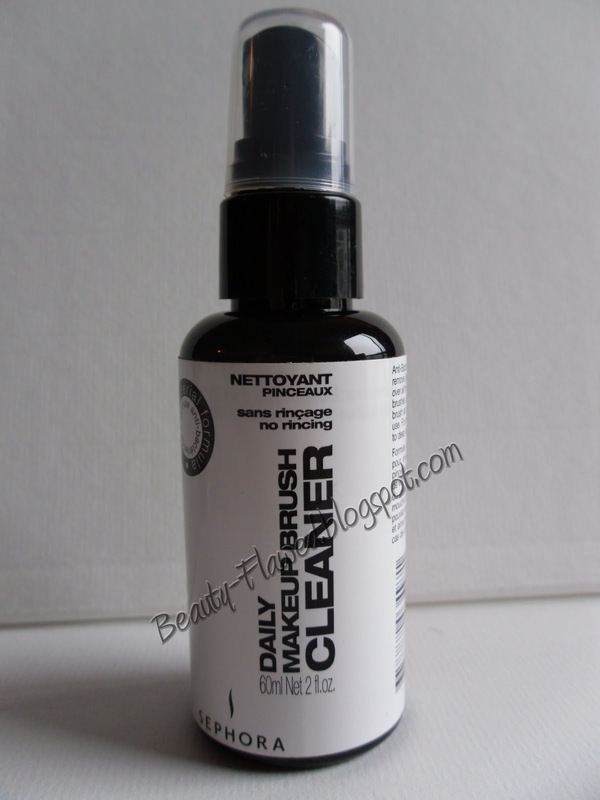 I picked this daily brush cleaner up around the time I was doing a lot of traveling and didn't want to lug around more than I needed to. Sephora Collections Daily Makeup Brush Cleaner is a very convenient way to remove excess makeup from your brushes while traveling or when your just in a hurry. I also like to use this between deep cleaning my brushes to keep them feeling fresh. They have since changed the packing on this to a all black bottle with white writing. The fragrance on this product is quite nice its fresh and not over bearing, you can smell the alcohol that is used in it so that's not the greatest thing to get a whiff of. I use this on all brush types from eyeshadow to foundation brushes and it does not dry them out, just leaves them feeling clean and fresh. On smaller brushes like shadow brushes i usually just use 1-2 sprays and wipe on a clean paper towel or tissue and it dries fairly quickly. Keep in mind this will not replace deep cleaning your brushes this is just a great way to keep them clean in between washes. Its always good to use something on your brushes in between to help prevent breakouts or any other germs from affecting your skin and eyes. I think this will also work on your brushes regardless of skin type, I have sensitive skin and have had no issues with it. If you have oily/acne prone skin it is defiantly a good idea to wash your brushes to help prevent any extra's getting left behind on your skin. I have just a little bit of this one left and its lasted me a little over 6 months, mind you I do not use it everyday because some days I'm lazy and don't feel like doing my makeup. :) So with that in mind I think I really got my moneys worth. You can get the small bottle for $6 or the big bottle for $14. I think next time I will pick up the big one because it lasts so long. If your a big computer nerd like me this product also works really well at cleaning your mouse pad or gaming mice. Works wonders to help break down all the oil from your fingers that can tend to stick to these sort of electronics over time. So if you in the market for a inexpensive brush cleaner that does it job this is a great buy and will last quite awhile in my opinion even if your using it everyday! I've also been using this cleaner for a while now. I actually really like it a lot and it lasts quite a while! 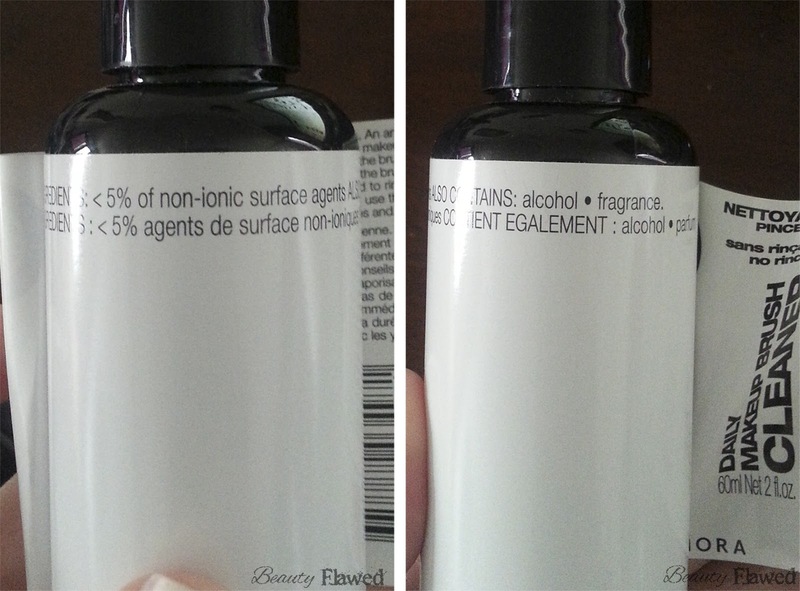 Can anyone provide a complete list of ingredients for Sephora's Make Up Brush Cleaner and Brush Shampoo? Usually these are listed on the bottle, or an attached label. Thanks so much! I also added two new photos so this is reflected better. Most brush cleaners are just a mix of rubbing alcohol and fragrance. You can even DIY your own quick brush cleaner by putting at least 70$ rubbing alcohol in a spray bottle. Hope this helps let me know if you have any other questions.